Did you know that if you make cookies with oatmeal stout, and make sure to leave the word “oatmeal” in the name, most people will think that they’re healthier than other cookies? I did! One night, as I cleaned up after our delicious evening meal and my lovely wife chatted with her friend, I decided I wanted a beer… and a dessert. 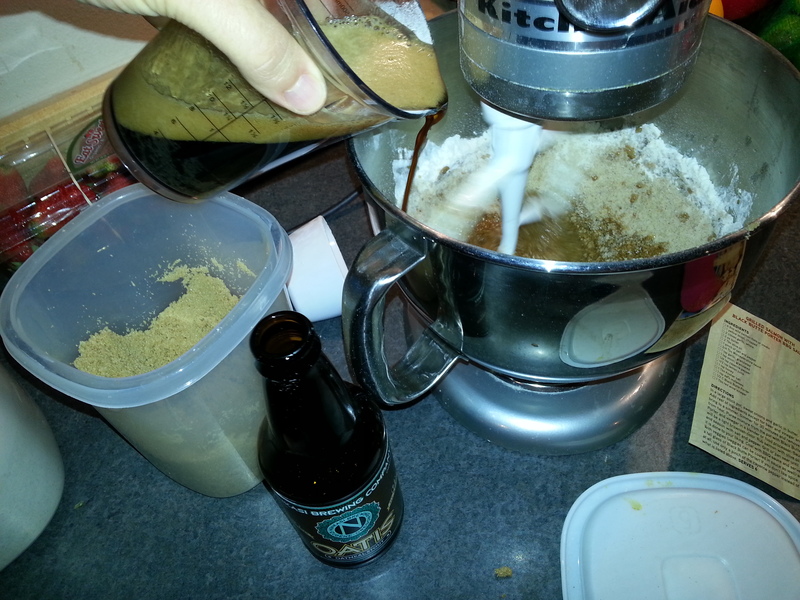 A friend – actually the husband of the individual with whom Krystle was visiting – had given me a booklet of recipes published by Deschutes Brewery, one of which used their dark and rich Black Butte Porter as the liquid base for a batch of cookies. That was my jumping-off point. 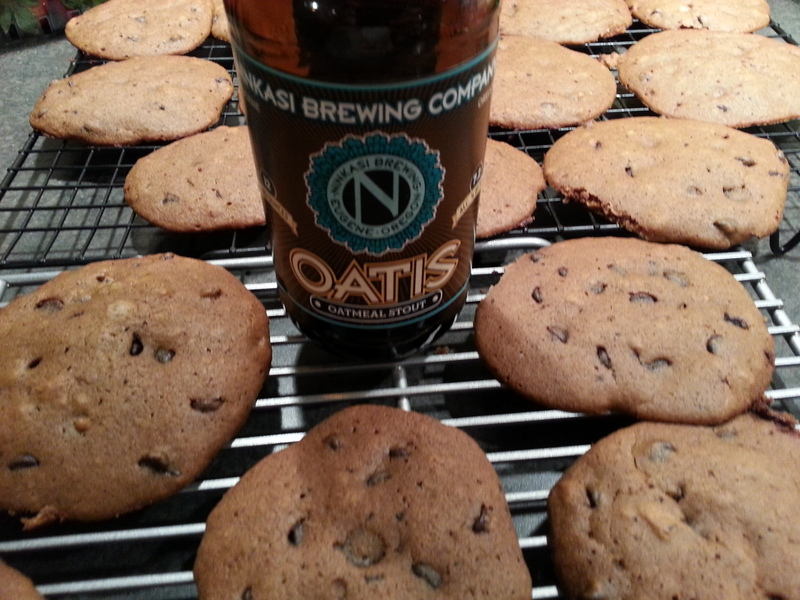 A clinking search of the beer shelf yielded a few bottles of Ninkasi Brewing’s “Oatis“. This full-bodied stout is well balanced and smooth, with enough hop character (50 IBU’s!) to stand out against the rich, creamy body. Rich and creamy? Smooth and strong? Sounds like it’ll go well with some chocolate! From that point, it was a simple process of finding the right ingredients, baking these little beauties, and enjoying the rich, fluffy result with friends and family. I call them “cakies” because – while they look like a cookie – they’re moist and spongy, like a satisfying slice of cake! Don’t worry, the batter tastes good! 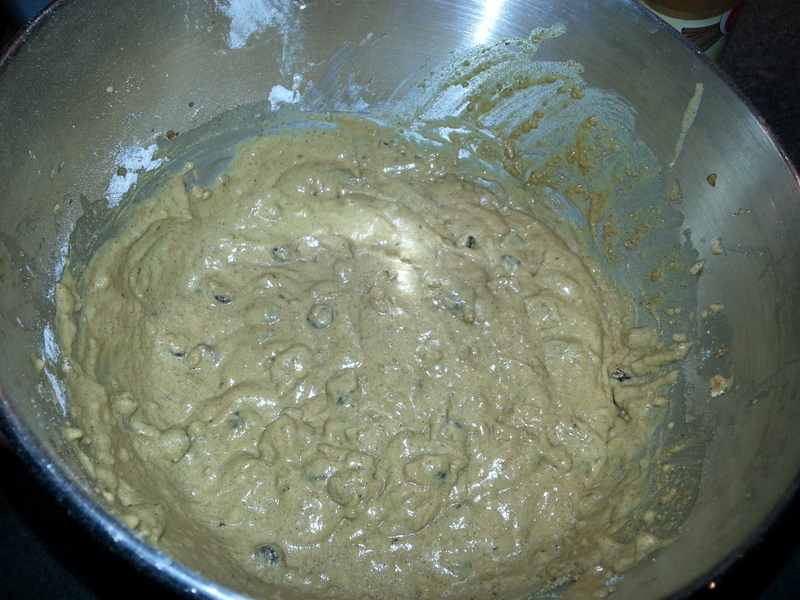 Cream together the butter and the brown sugar in a mixer. Cut in the flour, baking soda and cinnamon. Drop teaspoonfuls of the dough on a cookie sheet. The runny dough will spread, so leave plenty of room between dollops. Cool for a minute or two on the cookie sheet, and transfer to a wire rack to cool. Next Entry I Love Avocado Pesto!